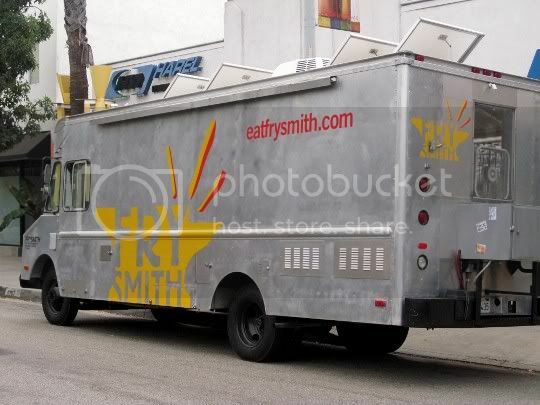 If you're on the lookout for some AMAZING vegan/vegetarian comfort food, and you see this huge aluminum truck on the streets, stop immediately! Frysmith, mobile purveyor of gourmet fry fixin's, is definitely worth following (both literally and figuratively). They also sell a variety of interestingly flavored cookies (green tea cranberry, anyone?) and "craft" sodas. Although they only have one staple veg menu item (plus occasional veg specials), that ONE item is well worth it! Word is the truck even runs on vegetable oil, and all of their materials (containers, forks, etc.) are biodegradable. Go Frysmith! Steaming hot, spicy, aromatic, and just flat out DELICIOUS. 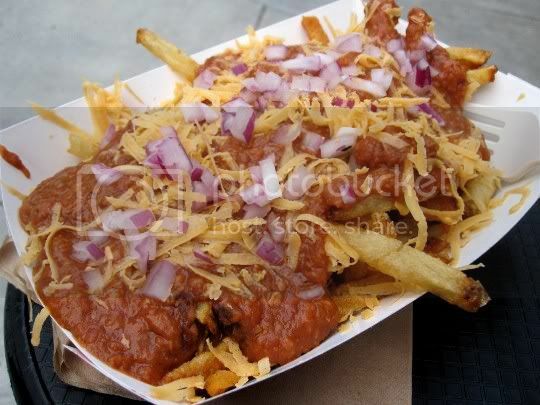 The container's worth of fries--topped with mounds of vegan chili, shredded cheese, and red onions--is almost too much to eat at one sitting. The shoestring-sized fries are fresh and freshly fried: for one, the skins are still attached, and two, they TASTE fresh...not like those previously fried-and-frozen-and-then-refried kinds. The chili is...OMG, the chili. Maybe I was just extra hungry, but the chili was some of the best I think I've ever tasted. It's sooooo full of flavor: sweet, spicy, smoky, tangy. The texture was a bit odd, I thought, for chili. No whole beans in sight, but more like refried beans with chunks of tomato here and there. I also didn't taste much soy chorizo either...but I DID taste an out-of-this-world combination of spices: paprika, cumin, cayenne, coriander, garlic, maybe even a little cinnamon and cocoa. Your cheese options are either regular cheddar, or vegan Daiya cheddar shreds. This was actually my first time tasting Daiya. It wasn't bad, and an acceptable substitute for dairy cheese: salty and savory, a little yeasty, and a bit processed-tasting. Frysmith could have been a tad more generous with the amount, but I suppose I'll just ask for more next time. Chopped red onions on top gave each bite a crunchy, pungent kick that was great with the chili. Sriracha and ketchup are offered as condiments, but these ultra flavorful fries needed neither. Follow again? Yes, although I hope they offer more veg specials or add some to the standard menu!